Reindeers Black Strap Molasses are very high in natural sugars and a variety of essential nutrients. Reindeers Garden Black Strap Molasses. 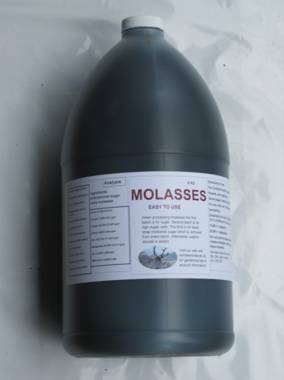 Easy To Use Black Strap Molasses is a very good organic plant food Contains ready available sugars, Many minerals to help increase the size of the fruit . Builds the biomass in the soil. Should be used when plants are ready to flower are fruit. Soil application only. Do Not Apply to Foliage. Use in compost to help speed up the composting.